STS-132 crew members, from left, Mission Specialists Michael Good, Garrett Reisman, Pilot Dominic Antonelli, Commander Kenneth Ham, and Mission Specialists Stephen Bowen and Piers Sellers pose for a group photo after arriving Monday, May 10, 2010, at the Kennedy Space Center in Cape Canaveral, Fla. The final launch of the space shuttle Atlantis is planned for Friday afternoon. The shuttle Atlantis' six astronauts flew into NASA's Kennedy Space Center on Monday in preparation for what's likely to be the spaceship's final orbital mission. "The spaceship is ready to go, and we're ready to fly," commander Ken Ham told reporters at the center's shuttle landing facility. "So look for a good show on Friday." Atlantis is due to begin its construction mission to the International Space Station at 2:20 p.m. ET Friday. 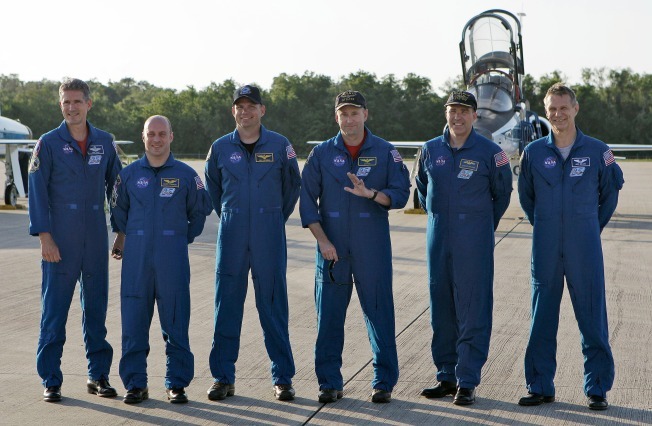 The astronauts made the trip from Texas to Florida in their T-38 training jets on Monday afternoon, and will be making final preparations for their spaceflight over the next few days. The launch countdown is due to begin at 4 p.m. ET Tuesday. The station-bound cargo packed aboard the shuttle includes Russia's Mini Research Module 1, also known as Rassvet (Russian for "Dawn"); a replacement communication antenna and six replacement power batteries. Ham's crewmates on the flight include pilot Tony Antonelli, robotics lead Piers Sellers and spacewalkers Steve Bowen, Mike Good and Garrett Reisman. All six astronauts are veteran spacefliers. The 12-day flight is expected to be the 25-year-old Atlantis' final space mission — at least for now. After its return, the orbiter will be prepped to serve as an emergency rescue vehicle in case the last scheduled shuttle mission, to be flown by the shuttle Endeavour no earlier than November, runs into trouble. There's also a chance that Atlantis will get one final turn in space, if NASA is given the funding for an extra flight sometime next year. But eventually, Atlantis and the other two shuttles are destined to be transferred to museums. Once the shuttle fleet is retired, the space agency will have to rely on transports provided by Russia or by commercial companies such as Maryland-based Orbital Sciences or California-based SpaceX. SpaceX's first Falcon 9 rocket is on a Cape Canaveral launch pad, just down the road from Kennedy Space Center, awaiting a test flight that is due to take place sometime after Atlantis' launch.